June | 2012 | Historic Vienna Inc.
“Gone with the Wind” – is the movie for the evening of Saturday June 16 – 8:15 p.m. Enjoy a movie under the stars! Free admission. Free popcorn. Cold drinks for sale by Historic Vienna, Inc.
Bring a blanket or chair. No alcohol permitted. Weather Permitting. Call (703) 255-7842 for weather information two hours before showtime. 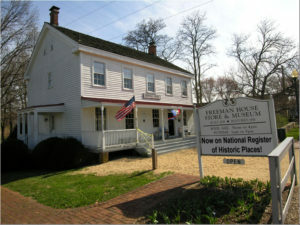 Freeman Store and Museum Added to the National Register of Historic Places! The National Park Service has named the Freeman Store and Museum to the National Register of Historic Places. After a multi-year application process involving Historic Vienna, Inc. and the Town of Vienna, together with HistoryTech, a consulting firm hired to do additional research and prepare the actual application documents, the structure was listed on the Virginia Landmarks Register by the Virginia Department of Historic Resources in fall of 2011. In April, 2012, the plaque commemorating the Virginia designation was unveiled. And we waited. The process is extremely exacting and information is checked, re-checked and then checked again, with questions about the structure itself and the history of the building’s use. Every detail has to be documented, every fact cross-checked, to ensure that the application is accurate and to maintain the integrity of the application process, as well as the significance of the designation. The Freeman House was built in 1859 by Abram and Susan Lydecker as a store and residence, the traditional “living above the store” structure. It was advantageously located on the town’s main commercial street – Church Street – as well as being adjacent to the railroad line. In May 23, 1861, the Lydecker’s store was one of the polling stations at which Fairfax County’s citizens cast their ballots on whether to secede from the Union. Vienna voters, voted 77 to 44 against secession, one of only three precincts to do so. During the ensuing war, both Union and Confederate troops occupied the house, which served as a hospital and military headquarters. Post-war, the store passed to the Lydecker’s daughter and son-in-law Anderson Freeman and subsequently to their son Leon. In addition to operating the business, Leon Freeman founded the Vienna Volunteer Fire Department, with a horse-drawn chemical pumper (which can be seen today at the new VVFD building on Center Street), became a Director of Vienna’s first bank, and served as Mayor and as a member of the House of Delegates. In 1929, the store closed. The structure was in disrepair when the Town of Vienna purchased it in 1969 and formed a committee of interested citizens to plan and advise on the restoration and future use of the building. This committee became Historic Vienna, Inc. in 1976 and the restoration was celebrated as a National Bicentennial Project by the Town. Today, the Town continues as the owner, while Historic Vienna, Inc. owns the interior furniture, collections and fixtures and operates the Freeman Store and Museum. The first floor Freeman Store maintains the ambiance of a late 1800s general store, complete with pot-bellied stove and an ever-ready checker board. The second floor has a parlor and dining room with period furnishings, together with an exhibit space where HVI’s volunteer Museum Committee has mounted exhibits using our own collections (“From Our Attic”), traveling shows from the Virginia Museum (“Jamestown”) and items on loan from other organizations (the Vienna Volunteer Fire Department) and individuals (“Vienna Remembers World War II” and the current “Vienna Awakens To War: 1861 – 1865”). There are also mini-exhibits using the downstairs hallway and permanent collections of documents and descriptive materials on display. 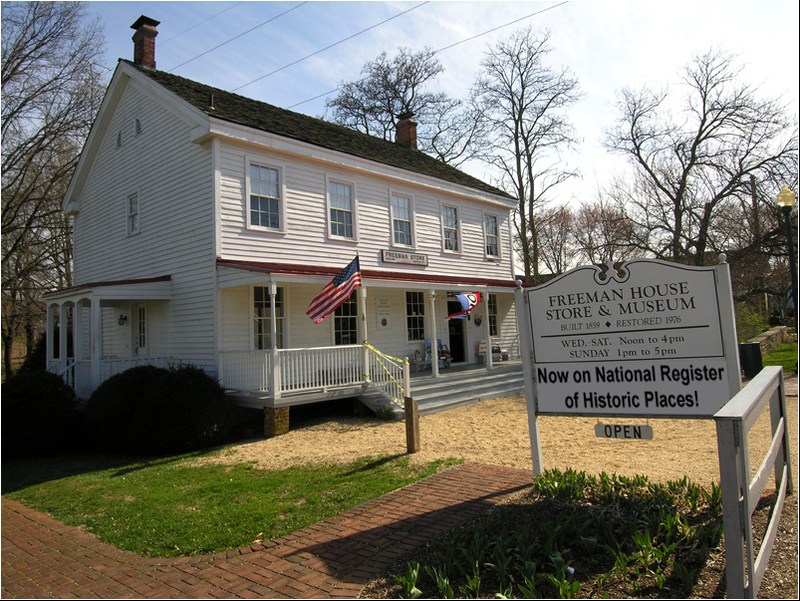 Special thanks are due to both individual HVI Board members and to Town staff – each of whom insist that they were “only doing their job.” At the least, they did those jobs in exemplary fashion and will leave a legacy of success: The Freeman House is on the National Register of Historic Places and the Virginia Department of Historic Resources Landmark Register. A ceremony to unveil the National Plaque is being planned for Spring of 2013. Mid Atlantic Vintage Baseball League and living history exhibition as part Vienna’s ongoing 150th commemorative observation of the American Civil War. Mark those calendars June 23! The event will be held from 11:00 AM-5:30 PM, with games from 12:00-5:30 PM. Living History Exhibition includes telegraph, first person spy impression, signal flag demonstration, quilting, bonnet and soap making etc. The first Civil War era ball game played by 1864 rules starts at noon and lasts approximately 90 minutes. The next game start at 2:00 PM. And 4:00 PM Is the scheduled time for the last round robin game of the day. The exhibition grounds are open until 5:30 PM. Come and see how the game was born, how it used to be played (without gloves!) renew your love for the game or find a new one. This is the perfect history activity to do with your dad, grandson, etc. see you on the Caffi ball fields on June 23. Additional parking at Vienna Elementary school and at Vienna medical Center on Park Street (the latter after noon).